Olde Burnside Brewing is a family owned and operated craft brewer in East Hartford, Connecticut whose flagship brew – Ten Penny Ale – was selected craft brew of the year in 2005. 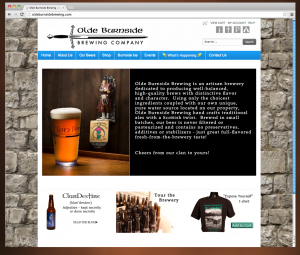 They needed a website that would provide their customers a contact point while also integrated an eCommerce storefront for Olde Burnside Brewing branded glassware, apparel, swords and tap heads. We created a website that helped tell the story of Olde Burnside Brewing and the company’s extended history as an ice house, created social media integration to help clients stay in touch, developed a blog component and provided an easy way for clients to schedule brewery tours online. In addition we create an integrated eCommerce solution complete with product onboarding and photography services and helped Olde Burnside Brewing to take its goods to a much larger online market.